The following user features can be switched on or off per number. 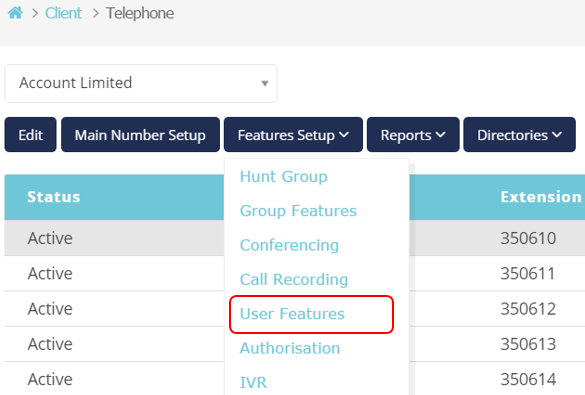 To access the user features highlight the number in question and select User Features from Features Setup. Anonymous Call Rejection: The Anonymous Call Rejection service enables a user to reject calls from parties who have explicitly restricted their identities. Another name for this service is Anonymous Caller Rejection. Selective Call Rejection: This feature allows you to block specific telephone numbers from calling your number. If the caller is blocked from reaching you, they will be presented with a busy tone when attempting to call. CLI Presentation: The Configurable Calling Line ID feature allows an alternate calling line ID to be presented to the called party when the user makes a call. Music On Hold: The Music On Hold user service enables a user to play custom music to callers when the call is held or parked. It is used in conjunction with the group Music On Hold service and requires the group Music On Hold service to be assigned to the group. Simultaneous Ring: The Simultaneous Ringing Personal service enables a user to have multiple destinations ring simultaneously when calls are received on their phone number. The first destination to answer the call is connected. This service is helpful, for example, when the user is not at their desk and would like their cell phone to ring when they receive a call. When user is already on a call, his/her simultaneous ring numbers won’t be called. The user is always required to answer confirmation. Sequential Ring: The Sequential Ringing service allows a user to define a “find-me” list of phone numbers and URLs, which are alerted sequentially upon receiving an incoming call that matches a set of criteria. While the service searches for the user, the calling party is provided with a greeting followed by periodic comfort announcements. The caller can also interrupt the search at any point to leave a message by pressing any number key. Priority Alert: The Priority Alert service enables a user to have a certain incoming calls ring on their phone with a different tone, for example, when they receive a call from their manager or spouse or when the call is from inside the group. Call Forwarding: The Call Forwarding service allows a user to redirect incoming calls to another destination automatically. Voice Mail: Voice mail service allows an incoming caller to leave voice mail to an extension number. Voice Mail to Email: Voice mail can be forwarded to an email address. Reset Voicemail PIN: Will reset the PIN to the number shown on the telephony manager screen. This will reset your Voicemail PIN, as well as the PIN used to log in to your handset.